There are a few books that I just over-enthusiastically recommend to everyone and anyone, for no greater reason than that they have had a lasting effect on my life having read them. They include Elijah's Mermaid by Essie Fox, Dice Man by Luke Rhinehart, and oddly, a really rather "bad" (by which I mean clichéd piece of typical "chick-lit") book called Sundowners by Lesley Lokko. 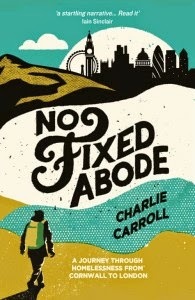 Recently I read No Fixed Abode by Charlie Carroll, which has possibly had a more profound effect on me than any other book I've read. I consider myself a kind person, and a compassionate person, and a person with a great deal of empathy for other's struggles, whatever form they may take. This book, however, with it's disarming mix of colourful story telling and gripping, biographical content, threw me sideways and made me reconsider almost all of my preconceived ideas and attitudes regarding homelessness. Before reading this book, I was always filled with sympathy for the homeless (so I thought), and if I had spare change on me and someone asked, I was generally happy to pass it on (not that it's ever very much, if you've seen inside my purse!). Charlie's book really lifts both the ugly and the moving lids on homelessness though, and gives so much food for thought. As a brief summary, between jobs, the author decides to walk from his home in Cornwall, to central London, living along the way as a modern-day tramp, hoping to experience the reality of homelessness in Britain in the 21st century, as well as exploring whether tramps, in their traditional sense, still exist. No Fixed Abode is the story of Charlie's journey, and the incredible stories of the people he meets along the way, written from the diary that he kept at the time. From the homeless community in Bristol, to the mass rough-sleeping on London's Strand, it had me in tears in parts, really angry at myself in others, and thoroughly rooting for some of the bizarre characters he encounters! If you usually reach for romances and comedy, then this possibly isn't the book for you, but it's by far one of the most intriguing, disturbing and at many times, oddly uplifting, books that I've read in a long time, and has forever changed my response to homeless people that I come across on a daily basis.